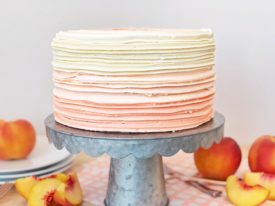 Peaches and Cream Cake – layers of tender peach cake, peaches and cream filling, peach compote and a whipped vanilla buttercream. It’s finally here! I’ve been through several rounds of recipe testing with my new Peaches and Cream Cake and I’m so pleased with the end result. A couple months ago, Avery informed me she wanted a peach cake for her birthday. 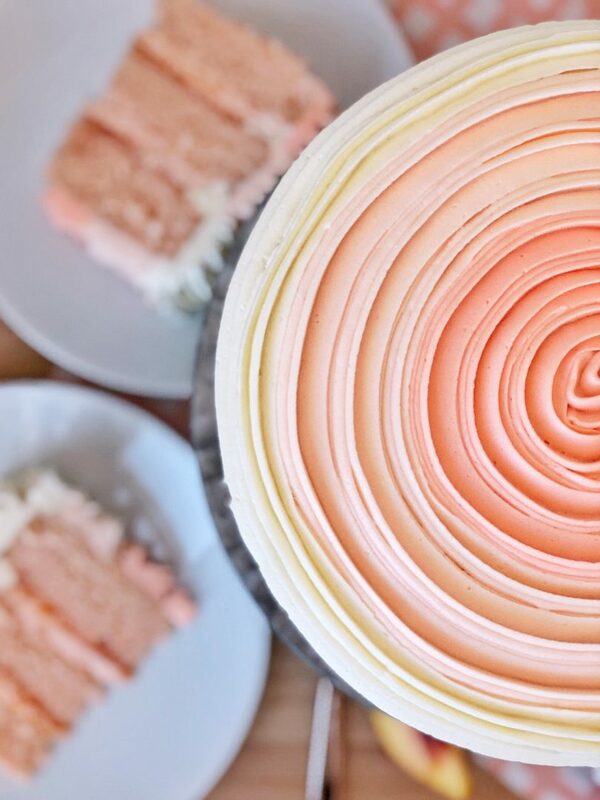 “Peach cake layers, peach frosting, and it needs to be orange,” were her exact words. I asked if she meant that she wanted my Peach Crisp Cake, but no, Avery wanted a brand new peach cake, done exactly as she described. She’s certainly a girl who knows what she wants. But still, I expected her cake choice to change at least a half dozen times before her birthday. Nope! She never changed her mind once. So, last week, I got started on the cake. I’m not sure why, but I expected this cake to be a breeze to make and put together. Whoa! Was I wrong. As I thought about these options, I immediately picked the peach puree to start with. I really wanted a natural peach flavor to shine in the cake. So, peach puree seemed like the obvious choice to make that happen. I added the peach puree to my cake batter (which I based off my Classic White Cake) and tried a sample before baking the cake. To my surprise I couldn’t taste the peach at all. Ugh! Honestly, I really thought it was going to be that simple. I still baked the cake (which didn’t taste any more peachy after they baked) and moved on to my next option – peach Jell-O. The flavor of the strawberry Jell-O in my Strawberry Cake makes for one of my favorite cakes. It’s actually not very artificial tasting and just has a really nice fruity flavor to it. I figured it would work great with peach too. Nope! Like the puree, the peach Jell-O didn’t add any flavor to the cake. Again, I was shocked. Peach was all of a sudden as hard of a flavor to bake in a cake as watermelon (you can read all about that cake saga HERE). After the first two failed rounds of my peach cake, I ran out of time and ingredients. I decided to put the cake on hold until the next day. That night I talked about my failed peach cake attempts in my Instagram stories and loved all the feedback that came in. You gave me so many suggestions. I was suddenly so excited to try again the next morning. One of the ideas was to use freeze dried peaches. Of course! Why hadn’t I thought of that. I love the way freeze dried strawberries and raspberries add natural flavor to buttercream. Peach would probably do the same for my cake. So, that next morning, the kids and I set out on a hunt for freeze dried peaches. That’s when I hit my next hiccup! Freeze dried peaches are so hard to find! I checked my natural food stores, Wal-Mart (which usually has them but was out), and my regular grocery store. Nothing. Right as I was about to give up, someone told me to check Target. Hallelujah! Target had them and my defeat disappeared once more. I was sure this round would be my winner. As soon as we got home, I blended up my freeze dried peaches and added them to my batter. I couldn’t wait to try it, but again, no peach flavor! The kids both tried the batter and agreed they couldn’t taste any peach. At this point, Avery was panicking that she would have to pick another cake recipe. No way could I disappoint her! Nor was I willing to give up on this peach cake. I was determined to figure something out. I then tried the oil and some flavored syrup, which both turned out to be way too sweet and artificial. For the next round, I got my hands on some peach nectar and crossed my fingers. Thank the heavens, it finally worked! I finally tasted some peach in the cake. I was pretty pleased with it but actually had a little adjustment I wanted to try. In my Peach Crisp Cake, I use peach yogurt instead of buttermilk and I love the moisture and subtle hint of peach it adds to that cake. So, I used half peach nectar and half peach yogurt, and finally felt like I had the cake I was looking for this whole time. 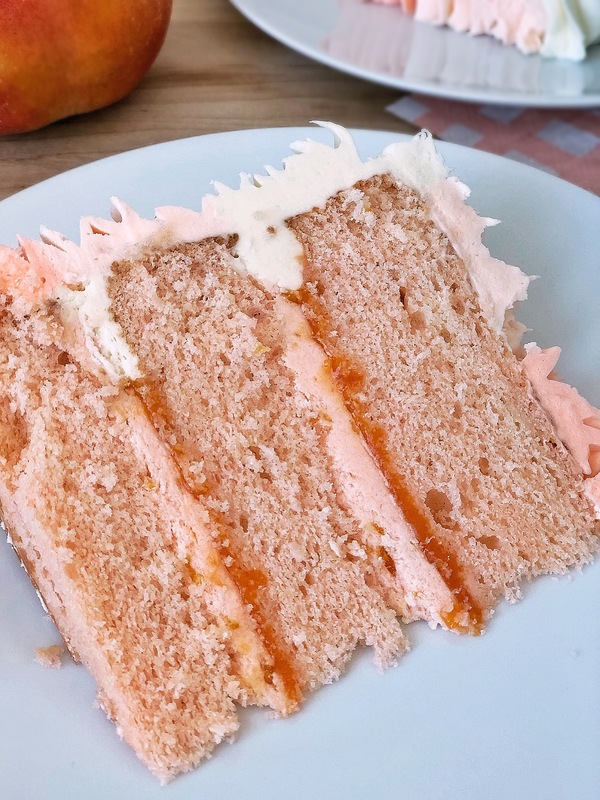 It’s certainly a subtle flavor of peach in the cake, but it’s there (and it’s not at all artificial tasting!). Plus, the peach flavor in the cake is enhanced by the peaches and cream filling and peach compote. Add all that to a vanilla buttercream and it really tastes like peaches and cream. I knew with the subtle peach flavor of the cake, I’d still want plenty of peach flavor in the rest of the cake. 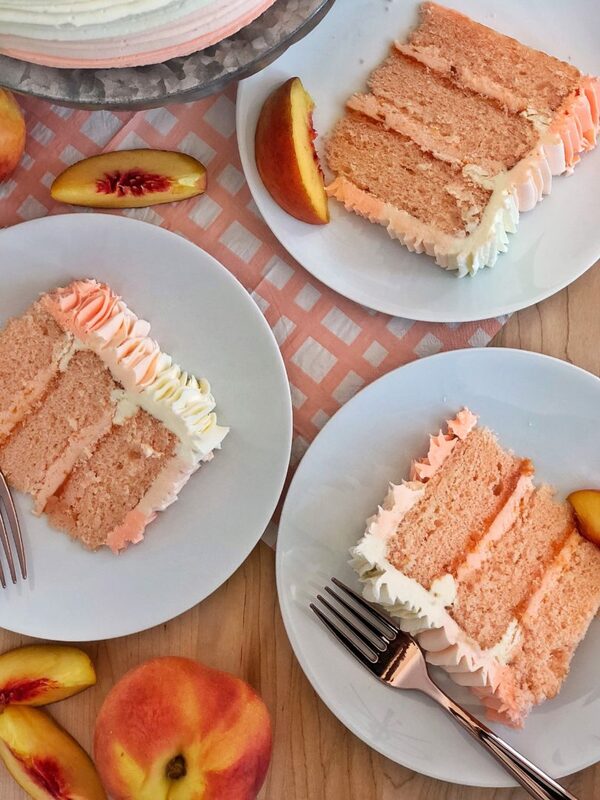 My favorite part of this cake is the fresh peach compote made with fresh peaches. You’ll use a little of it in your peaches and cream filling and then some of it as a filling by itself too. If there’s any leftover, save it to serve with each slice of cake. If you don’t have fresh peaches to make the compote, you can use canned peaches drained) or frozen peaches. You can also use peach jam in the peaches and cream filling instead of the compote. I tried all of these options and was pleased with them as back ups to fresh peaches. And here’s a short video tutorial to take you through the steps of the assembly process, all of which is also outlined in the instructions below. 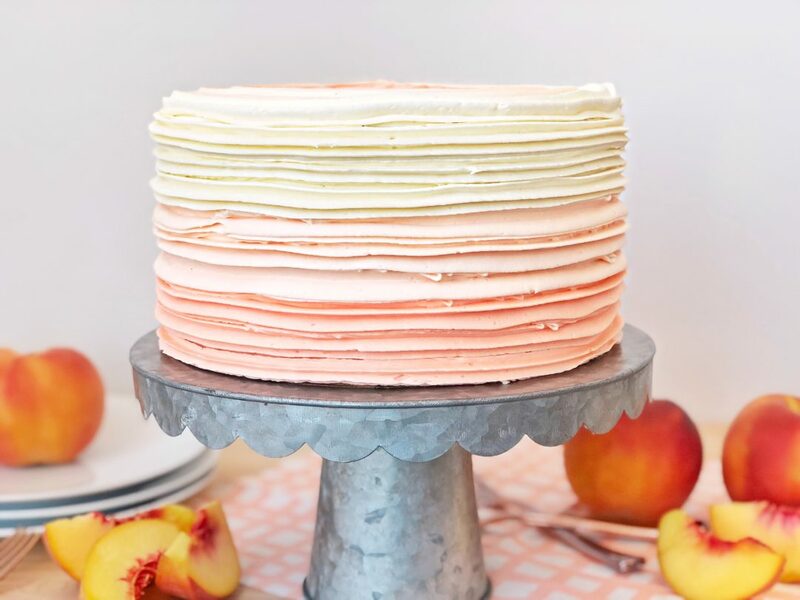 Light and fluffy peach cake layers with a peaches and cream filling, peach compote and vanilla buttercream. In a medium bowl or measuring cup, combine and stir the egg whites, whole egg and the clear vanilla. Set aside. In another small bowl or measuring cup, combine the peach yogurt and peach nectar. Stir to combine. Set aside. Add the butter one piece at a time, about every 10 seconds. Once all the butter is added, pour in the peach yogurt and peach nectar mixture and mix on low for about 1 minute, until the ingredients are incorporated. Scrape down the sides of bowl and begin to add the egg mixture in 3 separate batches, mixing on medium-low until light and fluffy, about another minute. Fold once or twice to ensure the batter at the bottom of the bowl is incorporated and mix for another 20 to 30 seconds. Using a kitchen scale, divide batter evenly among your pans (about 14 to 15 ounces of batter in each of the 8-inch pans, spreading evenly with a small offset palette knife. Bake until a cake tester or toothpick comes out with a few crumbs when inserted into the center, about 18 to 20 minutes (mine only took 18 minutes). Check cake at 18 minutes and then set the timer for 2 to 3 minute intervals if the cake needs to bake longer. You're looking for a few moist crumbs to come out on the toothpick when inserted into the center of the cake. Over baking your cake will dry it out. In a medium saucepan, combine the peaches and sugar. Cook over medium heat, stirring occasionally, until the peaches are soft and the juices start to boil. Remove from the heat and puree in a blender until smooth. Return the puree to the saucepan and add the sifted cornstarch. Cook on low until mixture thickens. Cool completely before using in the cake. I recommend making the compote a day or two before you assemble the cake. The compote can be stored in an airtight container in the refrigerator for up to a week or in the freezer for a month. Combine 2 cups of the vanilla buttercream with peach compote or peach preserves. Stir until combined. Place the first cake layer, top side up (crumb side up), on a cake board or cake plate. 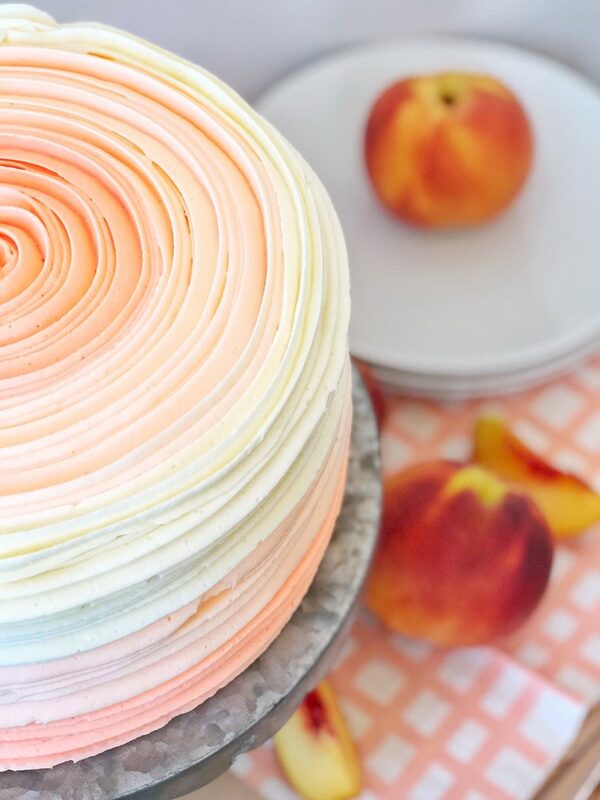 Using an offset icing spatula, spread about a cup of the peaches and cream filling over the cake layer. Pipe a rim of the vanilla buttercream around the edge of the cake. This will help support the cake layers and prevent the peach filling from spilling out. Spread about 1/4 cup of the peach filling on the cake layer. You don't want to add too much or your cake will be unstable as you stack and decorate. Reserve any left over compote to serve with the cake later. Gently place the second cake layer on top of the filling and repeat steps 2 to 3. After the filling is set, use a small amount of vanilla buttercream and apply a crumb coat around the entire cake. Freeze the cake again for another 10 minutes to set the crumb coat. After the crumbs are locked in, continue to frost and decorate the cake with the remaining vanilla buttercream. To achieve a peach color, I used "orange" and "soft pink" Americolor food gels. Is there a particular brand of the nectar and yogurt you recommend? Thanks again!! I was rooting for you when I watched all your stories in insta! No, I don’t have one brand I think stands out better than the rest. Use whatever you can find easily. and thank you!!! This cakes sounds amazing!! Where do you find Peach Nectar? Do they have that at the grocery store too?? Yes, you should be able to find peach or apricot nectar in the juice aisle. This looks delicious! Two questions -1) if I can’t find peach nectar what can I use as a substitute? 2) what decorator tool did you use? Apricot nectar is usually pretty popular in stores in the juice aisle. That would work great. I also used a cake scraper to smooth out the sides and then the Wilton 1M tip to pipe. Finally found peach nectar & ready to make this cake. What decorating tool are you using for this lovely cake? Yay! Hope you love it. I used a Wilton 1M tip to decorate. Cant wait to try this for my Birthday! Hey! This cake looks amazing! Would it be possible to make this recipe in cupcake form? Thank you in advanced! I actually haven’t tried it as cupcakes. I usually just stick to cakes, but it’s definitely worth a shot. Made your cake today! Delicious! Posted a picture at livforcake blog – gave recipe credit to you. The reverse creaming method works great. It’s the Wilton 1M tip. I am so excited to make this cake for my mom’s birthday! I will be out of town right before and wanted to make some of the stuff to freeze before so I am not doing everything the day before. I was planning on making the cakes and freezing them, but could I also make the compote beforehand and freeze it? Hi, I just made one batch of your cake recipie but the cake layers are too thin compared to your pics and video. Did you make 2 batches? Also, my cakes turned out white and just tastes like a moist vanilla cake :/. I guess cuz peach yogurt was pretty much white in colour. Did you use food colouring in the cakes as well? I did add some food coloring to enhance the color. As for the height of the cakes, what size pans did you use? 8″ or 9″? Also, is your baking powder old? I use BP that is less than 6 months old, otherwise it likely won’t help your cake to rise.